Although Samsung didn't embark on an accessories adventure quite like LG did, it still had one more trick up its sleeve. Meet the Samsung Gear 360, an answer to LG's 360-degree camera. Like its competitor, the Gear 360 is designed to let consumers easily capture, see and share their life moments via spherical video and still images. You can shoot with the Gear 360, edit the results on select Samsung Galaxy phones, view them on their screens or the Gear VR headset, and share them on social media. In addition, PC software is available for more in-depth editing. The footage is stored on micro SD card, up to 128 gigabytes in capacity. 360-degree video has become a popular format for online videos, with services like Samsung Milk VR, Facebook 360, and YouTube 360 providing a platform for sharing 360-degree footage. The Gear 360 captures immersive photos and videos at a very high resolution (3840 x 1920) through its dual fisheye lenses. The results can be seen both in 2D (via a dedicated mobile app), or in 360 degress through the Gear VR. Users can also choose to shoot 180-degree wide angle video and images by only using one side of the camera lens. At only 153 grams, the Gear 360 is light and compact, with a spherical design that ensures portability. The gadget also comes with a tripod and supports the industry standard thread sizes so it should work with most accessories and mounts on the market. Additionally, the Gear 360 is splash-proof and dust-resistant, so filming your outdoor adventures won't pose a challenge for its safety. The Gear 360 will be available in Q2 2016 in select countries. Lg 360 is better ..
LG has an amazing products this year. But Samsung Gear 360 is better. It sports 30 megapixels camera + more portable than LG 360 CAM. I see. I agree. 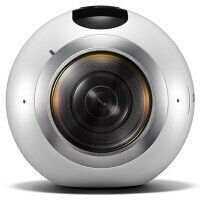 But Gear 360 looks prettier. I hope Samsung will release a water-resistant one. I'll replace GoPro for sure. How much could it cost 2k?